Milodon's Main Caps are designed to strengthen factory 2 and 4 bolt blocks and at the same time stop 'cap walk'. These main caps offer more cross sectional strength do to the side angled bolts, delivering more side pull of the side walls of the block and not on the flimsy main web area. The side bolts heavily load the cap against the register step, therefore reducing the chance of bearing damage and horsepower loss. 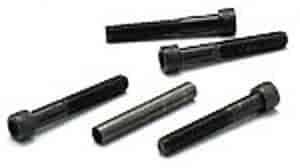 The main caps are CNC machined from high strength ductile material, which has proper balancer of strength and rigidity. All necessary bolts, washers and drill bushings are included in the kit. Note: For installation, only .030" of material removal is required, which will allow 100% cleanup on a damaged or crooked block. The drill bushing used to drill and tap the side bolt holes is included in the kit. The side bolts can be installed by anyone with a hand drill and a tap. If the block has square main registers, the block needs only a standard align bore to finish the job. Milling the mains is only necessary if the main registers are not square.